One of our Mare Verde holiday lettings: a studio with a double bed and 2 modern single sofa beds. There is also a washing machine in the shower room. One of our Mare Verde holiday lettings, this lovely studio is situated on the 1st floor and enjoys sea views (see photos). It has been beautifully refurbished in a modern style. It can sleep up to 4 people as it has a double bed as well as 2 single sofa beds. There is also a flat screen TV with satellite channels, including English speaking ones. There is a shower room with a walk-in shower and also a washing machine. A pretty harbour town with cobbled streets in the North of Tenerife. Garachico is a pretty harbour town with cobbled streets. 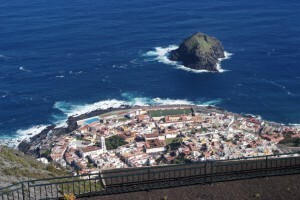 This styllish town is situated in the North of Tenerife and is well worth a visit. Today you will find a boutique hote here and the lava rock pools in the bay have been re-developped. You will be impressed by the pretty fishermans’ cottages and the grand town houses. In the 16th and 17th centuries is used to be the main trading harbour with banana steamers and sailing boats, which would transport Malvasia wine and sugar cane. It became a very important port due to it’s naturally deep harbour. But Garachico has known devastation in the past, but somehow has managed to pick itself up and rise to new heights. In 1645 there was a huge landslide caused by heavy rains, which destroyed 40 ships and killed over 100 people. But Garachico recovered, but a worse disaster was to follow. In 1706 Mount Teide erupted sending a molten lava flow down towards Garachico. Luckily the flow was slow enough to allow the townsfolk to evacuate on horseback and on foot. The trade was re-established in Puerto de la Cruz to the East. Today the main trade in Garachico in agriculture, mainly banana plantations.